Back to back appearances by the Cavaliers. This is another one of my favorite players around the conference. Just a treat to watch play. #11 on the ACCBR top returning players list is All ACC third team member, Ty Jerome. Guy may have the stroke, but Jerome has the distance. This kid has the type of range where if you don’t pick him up at half court, he might toss it up just to show that you made the wrong choice. When you do step up to take that away, he is going to go by you while throwing out a chicken wing. Which he will also get away with for whatever reason. If you only read the box scores you would assume Kyle Guy was the man on Virginia’s team last year. Personally, as stated earlier, I thought it was Devon Hall. Second on my pecking order is Jerome. He simply does it all. He scores 10.6 points a game, hands out 4 assist per game, hits the glass with 3.1 rebounds and plays defense, averaging 1.5 steals and logging the 3rd best defensive rating in ACC play while having the third most win shares at 2.7. Oh yeah, he is also clutch. Look for Jerome to once again lead this team to a special season. 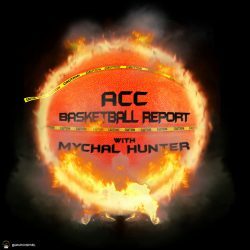 The ensemble of Guy, Jerome and sophomore De’Andre Hunter is one of the top 3 trios in the ACC. Some may think last season’s tournament loss will damage this team. Personally, I think it will galvanize them.